The last leg of your journey to Cape Wrath takes you across peat-dark rolling moors. It is tough going and trackless, but the wilderness is intoxicating. The North Atlantic will often be throwing its worst at you but it's a day you'll remember, especially when the lighthouse finally peeks into view as you round the final hill. As you climb from the sands of the bay, head east to the bothy at Strathchailleach (NC 249 657). Even if you're not intending to stay, it's worth poking your head in. The bothy was home to James McRory-Smith (also known as Sandy) for 40 years. He lived the life of a hermit with no gas, electricity or telephone, making only occasional journeys to the London Stores near Kinlochbervie to collect his pension and stock up on food. His atmospheric paintings still adorn the walls. The last section of land to the cape itself is part of the Cape Wrath Ministry of Defence (MOD) live firing range. You'll need to check in advance if any range activity is planned during your visit. Activity on the range is usually advertised in advance, call range control on 0800 833 300 or 01971 511242 for more information. 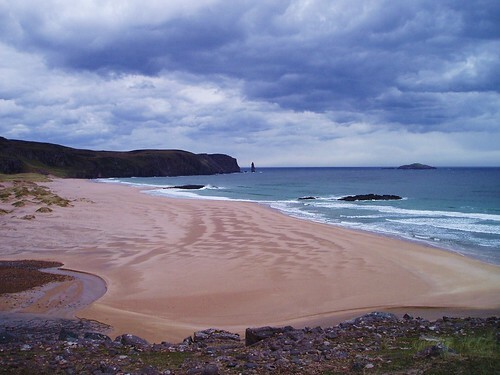 There is almost no mobile phone reception on Cape Wrath so all telephone arrangements or enquiries must be made in advance. A barbed wire fence marking the southern range boundary is encountered soon after crossing the Keisgaig river. There are no stiles, so this should be climbed with care. Red flags fly and warning notices are posted when the range is in use. 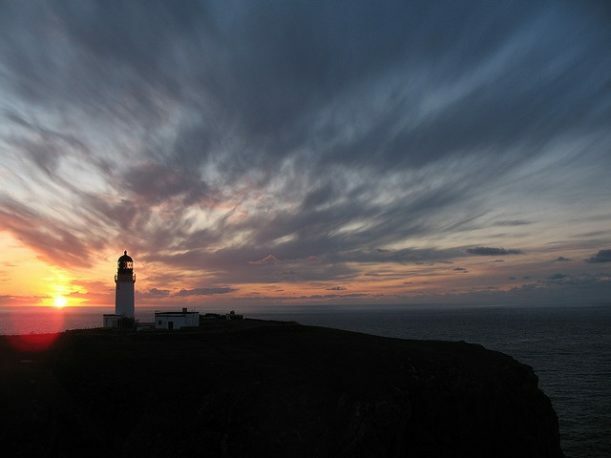 There is nothing much at Cape Wrath other than the automatic lighthouse and the jagged beauty of the towering sea cliffs. The light, built in 1827, can be seen for 40 kilometres and the now silent foghorn once boomed mournfully into the North Atlantic. These days the light is surrounded by a clump of mostly abandoned buildings, gradually surrendering to the sea winds. Amidst it all, a hardy entrepreneur, John Ure, runs a cafe which is open all year round. What sounds at first like a local joke at the expense of visitors turns out to be true and a warm cup of tea, soup, sandwiches and snacks can be had in the company of a large pack of springer spaniels. He can also arrange basic accommodation. The buildings at the cape are not the most pleasant place to camp. They have an eerie feeling as the wind whistles between them. If you're intending to camp, you may prefer to retrace your steps to NC 259 728 which is a sheltered and pleasant spot. There is also the superbly located Kearvaig bothy (NC 292 726. At the end of such an epic journey, as you wander through the slightly forlorn buildings hunched on the wind-seared cliffs of the cape, it's only natural to have mixed feelings. Elation at having reached your final objective, satisfaction at having endured the physical hardships along the way, humility in the face of the raw power of nature all around, regret or relief that the journey is finally over. It will take days if not weeks to process the magnitude of this experience, but as you float across the Kyle of Durness or retrace your steps to Kinlochbervie, it's worth reflecting on the words of John Muir, written more than a century ago, but still remarkably prescient: "thousands of tired, nerve-shaken, over-civilized people are beginning to find out that going to the mountains is going home; that wildness is a necessity." It's easy to get sucked back into the hectic pell-mell of everyday life, leaving trail memories distant, detached and unreal. But try to hold on to some of the sedate pace of the wilderness, remembering the simple pleasures of getting from one place to another, surviving and traversing a landscape that has existed since time immemorial. The cape will still be standing, solid and immovable, a giant buttress to the wild atlantic, long after our own time has come and gone. And you were there, in that place and in that moment. Further detailed information about access to and escape from Cape Wrath is available in the forum.